For my third and final Spicy Basil-Mint Pesto dish, I only had about 2 tablespoons of pesto left. 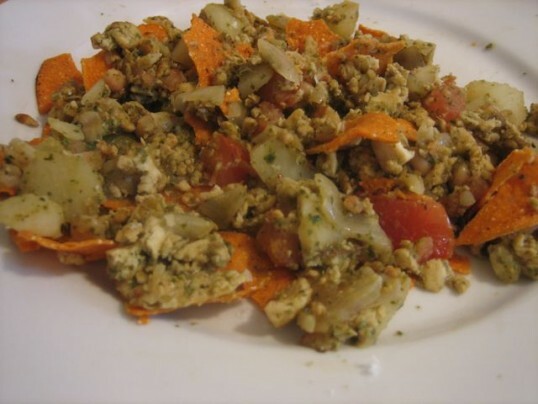 I got a little creative, borrowed some elements from Rajat’s tofu scramble and came up with a hearty breakfast of spicy pesto mixed with scrambled tofu, potatoes, onions and tomatoes topped off with chipotle flavored tostada shells. It made for a healthy, egg free breakfast. 1. Heat about a tablespoon of oil in a skillet. Add the onions and saute until translucent. 2. Squeeze the water out of the tofu. Use your hands to crumble into small pieces and then add to the skillet and cook until golden. 3. Add the beans and tomatoes and saute until the tomatoes are melted and the beans softened. 5. Mix about 1/4 cup water with the pesto and pour over the scramble. Cook on medium low heat for 2-3 minutes and then serve hot with tostadas. 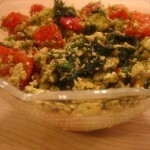 You might be also be interested in this tofu scramble and these other pesto dishes, pesto marinara and pesto bruschetta. Simply mouth watering. I couldn’t comment on earlier ones but all them are good. I hope I’m not spoiling the whole thing by asking a question…what exactly is a pesto? Never heard this word in my part of world or maybe I’m not aware. Is it a chutney sort of thing? Mm this looks good – I make tofu scramble all the time and I’m always looking for ways to make it more interesting! Thanks for this! 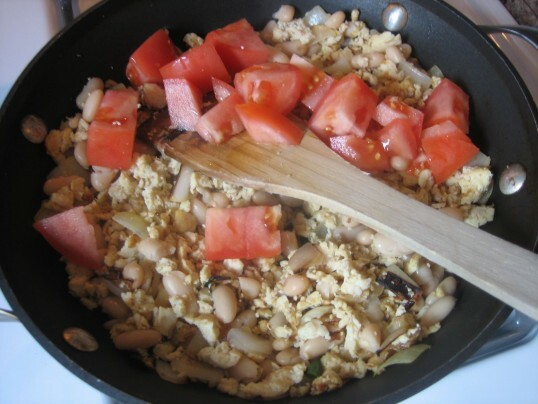 Same here…I love tofu scramble…I’ll have to try this soon. Next post: A Side of Roasted Cauliflower – Dinner Party Worthy?